It has been designed by Lactose Intoler-Art! @Kjeld Duits Hey! I knew you would be here in Miyagi covering the earthquake and tsunami. The photos are really unbelievable. It’s so sad what happened. My husband’s family is living in a town for about an hour away from Sendai to the North. A few days before the quake we went to Tokyo to search for an apartment, since we will move there from April. We were on our way from Tokyo back to the family home by bus on 03/11. We were having a break in Tochigi at a parking lot when the quake came. It was really scary. That day it took us 18 hours to get to Sendai by bus. The streets were really jammed. You can read my blog entry on how we experienced the quake and it’s aftermath if you have any time and if you are interested. Are you still here in Miyagi? When are you going back to Tokyo? Anyhow, please be careful while taking photos. It is wonderful to hear from you. I am really happy that everything is fine with you. Very scary experience. I am still in the disaster area, though I have based myself in Yamagata since earlier this week. I drive to different places from here. I just introduced your blog to my public private page on facebook and the JS facebook page. I hope that’s OK with you. At the moment I have reserved my hotel and rent-a-car through Thursday, but there is a large chance that my stay will be extended. I arrived in Sendai the day after the quake. Now, I think about it, the same day as you! Although I arrived in the evening. Amazing to think we were so close. In what city are you now? This video with info isn’t mine, but in the description it lists all the numbers you can text and from where. $10 will automatically be added to your phonebill. Thank you for the pictures! 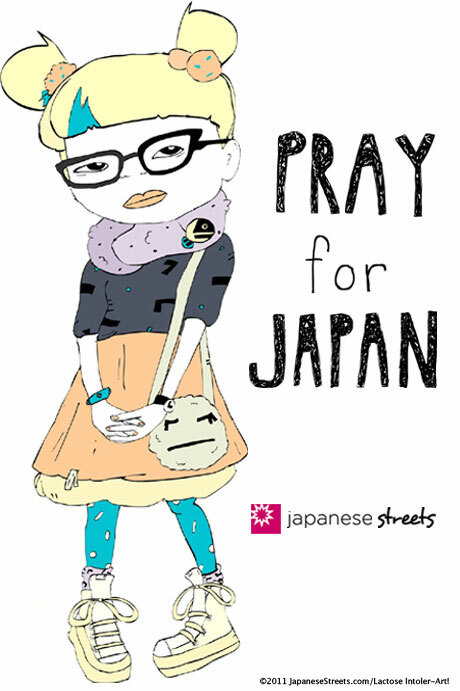 Although no close relations of mine live in Japan, I’m praying all the same for all the wonderful people. It’s so sad that this happened in such (for lack of better word) an amazing place. 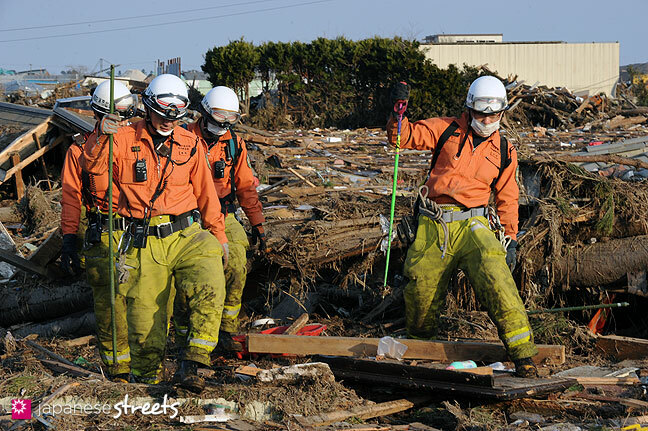 My friend’s father is also in Japan at the moment, covering the earthquake. He was going to be there for a few days, but extended his visit to several weeks. Are the earthquakes still coming? Stay safe! Keep taking amazing photographs! @Kjeld-Glad to see you are still safe and everything is ok. Stay as long as you need to, your fans aren’t going anywhere. The situation is really crazy and critical..And I personally would like to encourage everyone to not only pray for and think about Japan, but to also do whatever you can to help out. 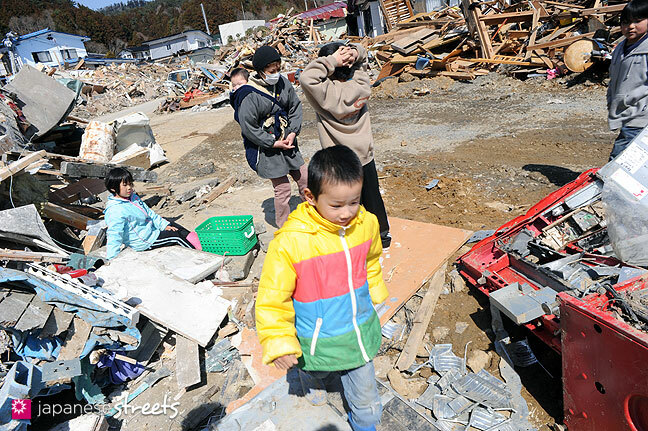 There are various charities and art auctions, etc that will be happening in order to make that possible..I think its going to be a long recovery for the Sendai area, but even a long emotional recovery for the rest of Japan. Thank you so much for using my artwork for this cause. I hope that it can be used for good somehow. And Kjeld, I wouldn’t normally do this, (feel free to edit this out, and I won’t post a link) but for people that are indeed interested in ways of donating/art auctions, etc..I have a new section up on my blog that lists lots of creative and fun ways you can all get involved. Stay strong Japan, we love you. I think it’s really brave of you Kjeld to go and take pictures in Sendai only one day after the earthquake, I appreciate it a lot. 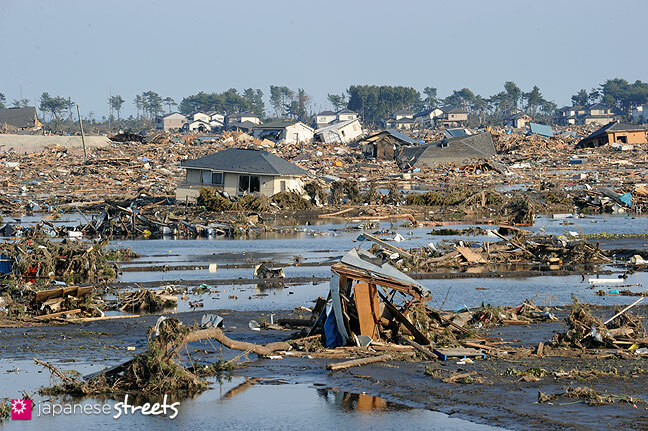 It’s hard to get to see pictures from the disaster area, but whenever I see some I get scared of how terrible they got hit. I have donated a little this month to Japan, but I plan to donate some money each month, as I don’t have that much money. 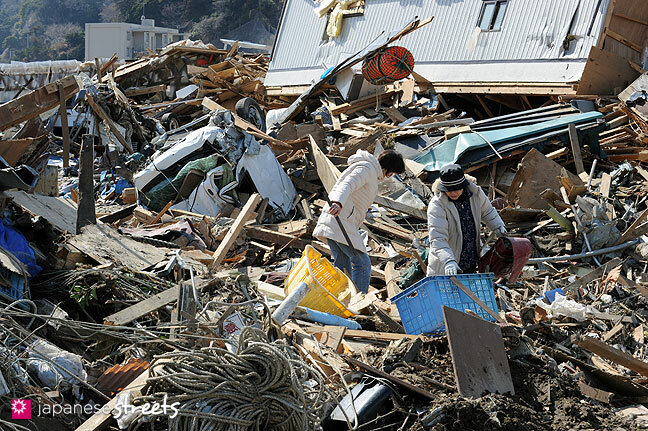 I hope a lot of people donate money to Japan so that the Japanese can get back on their feet as soon as possible! 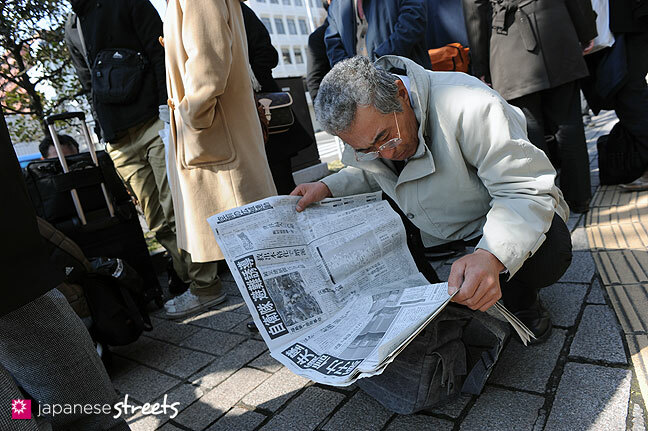 I’m going to miss Japanese Streets updates, but I fully understand why it’s impossible for you to update the site atm. – Thankyou for your wonderful work. I feel for all those affected by this tragedy. 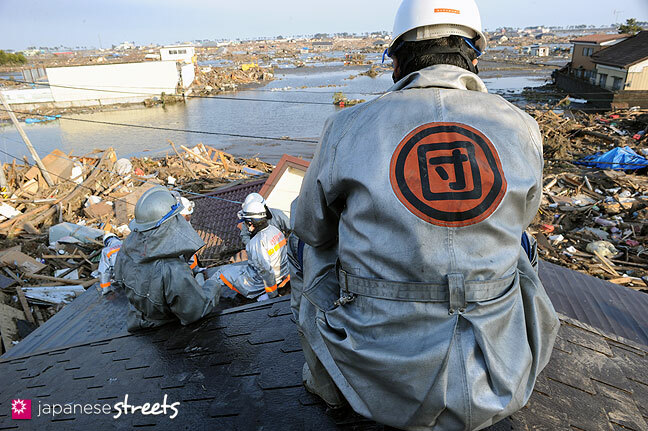 I wish I could send a print I made, “Japan we care” to everyone in Sendai…hope things get better soon. Ella has a donate button on her site. @Flightofthehumblebee, Tragic Angel, Pauli and Keekii: Thanks / Gracias! @Lactose Intoler-Art: Thanks, Brandon. The link is fine. Any links to help people know more about what’s happening in Japan are very welcome on this page. That’s what this page is for, to spread the news. @Kjeld: Thank you for sharing my blog post on your Facebook pages! I just started following them yesterday. I’m in Osaki city (大崎市) around an hour away by car from Sendai to the North. 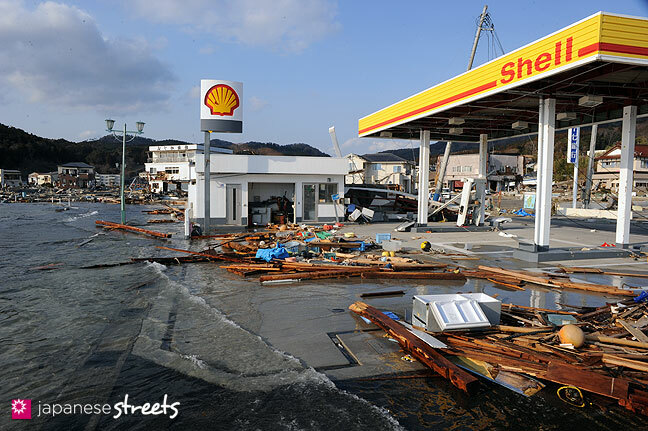 I wish I could go and help people somehow in the tsunami affected region, but we are really short on gasoline, so I don’t know how could we get there. Can you buy gasoline in Yamagata? Here it is really hard to get. 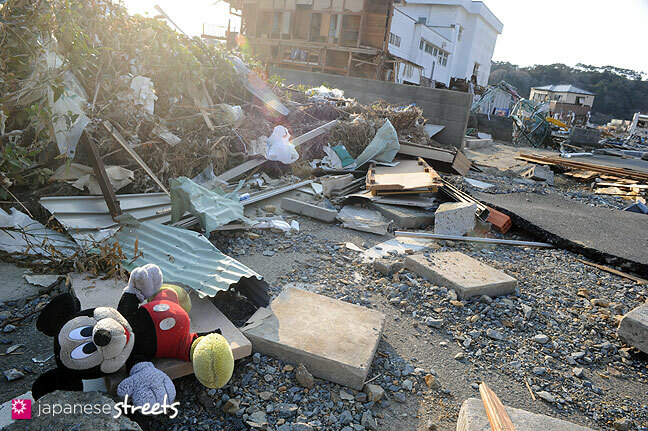 Are you travelling every day to Sendai and further to take photos of the disaster area? Where are you heading next? How long are you planning to extend your stay? 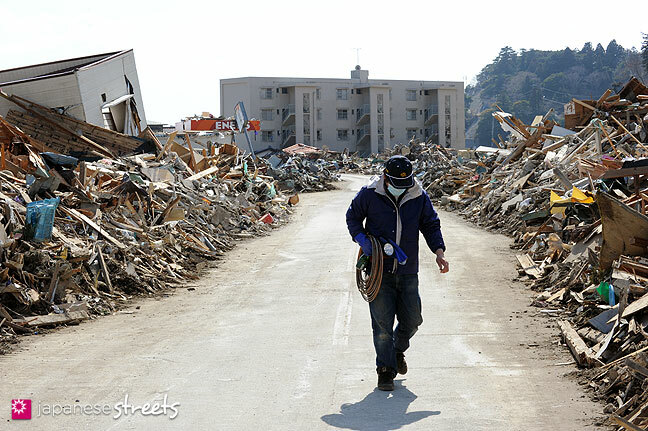 As you are going to the disaster area every day since the earthquake happened, do you think there is anything we could do if we would/could go there somehow to help? As we have to move to Tokyo until April we have not too much money left to donate, but do you think it’s better to donate than to go there and actually try to help somehow? I know that people’s safety is a top priority, but I heard that a lot of pets and animals are left behind too. I’m concerned about them. Do you know anything about that? What can be said, except that I admire, respect and adore the Japanese people. I am from the other side of the planet, in Madrid, and I am at a loss to know what to do to help. Donating to the Japanese Red Cross is fine, but it seems so little when so much needs to be done. gosh i feel so bad for the jap people :((( thats why we should be thankful for our blessings. I definitely pray for Japan. Like the majority of people I was deeply sadden when I heard about what happened in Japan. I wish the best for all the people of Japan. Thank you for these images! Seeing pictures and following your blog help make the situation more real for me. I won’t necessarily say this is the same for ALL Americans, but I feel that as an unaffected American, especially as a North Texan American who has experienced neither an earthquake nor a tsunami, it is hard for me to understand the situation completely, but being able to hear of it from one’s first hand account is very helpful. Also, today in my Economics class, we watched a video someone in Japan recorded of the tsunami in action, and i was shocked. Generally, when I think of a tsunami, I think of vicious waves crashing on buildings and destroying everything. But then, I actually saw what it was like; how the water moves so quickly, and how it is, in essence, like a giant flood. @Kjeld: You’re a brave man, and I respect you for what you are doing. Stay safe! Thank you very much, Ruth. Your words tough me deeply and encourage me a lot. 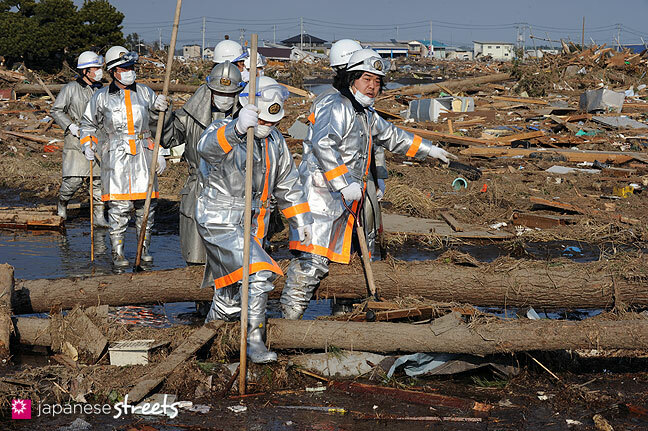 As you may know from my public personal facebook page I have started to coordinate aid activities in the Japanese disaster are for the German aid organization DEMIRA. Today the first truck with vegetables and fruit arrived. Tomorrow another one will canned and packaged food, and a huge refrigerator/freezer will reach the city we’re helping. I wish I could do more, but DEMIRA’s funds are limited at the moment. Hopefully, they will get lots of new donations for this project. In other news, Emi went shooting, so in a few days I’ll be able to upload new images of street fashion again! All my thoughts to you and Japan. I send all my prayers there and hope all the best for the future. And I am doing prayer to god.